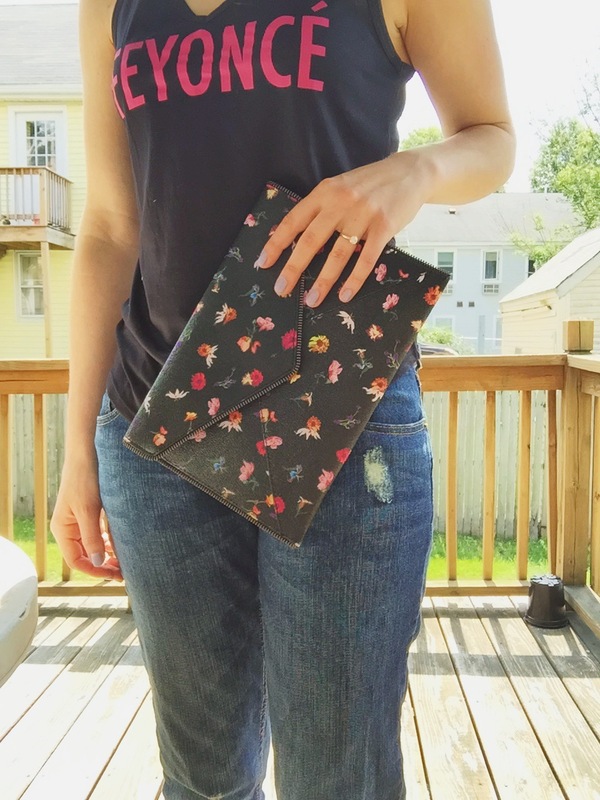 Friday, I’m in love…with Etsy. 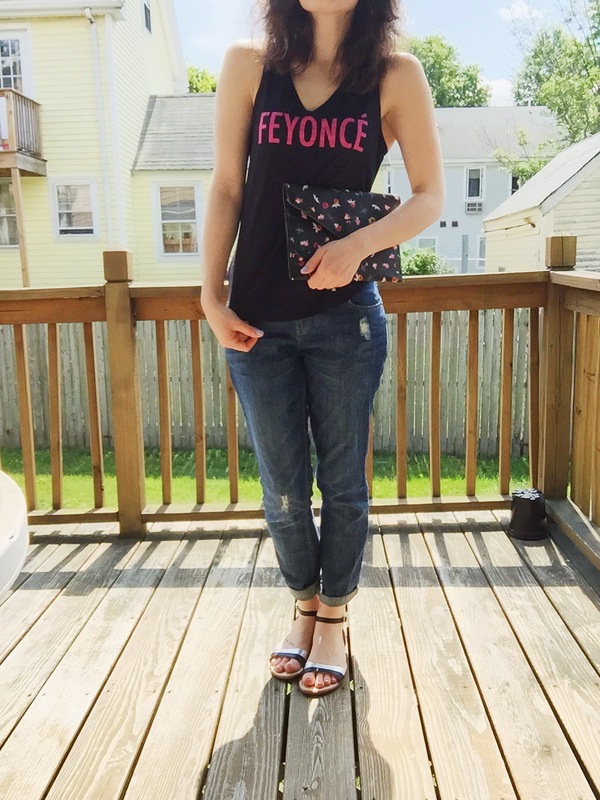 I had seen this post on Pinterest which made me long for a Feyoncé shirt to call my own. Luckily, I located this shop that hooked me up with a great tank (it is July, after all). The following photo, which was something of an outtake is the only one in which you can see my fakey-fake ring that I’ve been wearing to numb the pain of my real one not being back from the jeweler. Mani is Essie’s Lilacism. I want to write a love song to this nail polish. The fake ring is kind of a wacky story. As a kid, I spent a lot of time at my grandmother’s house. She and I are pretty close. One day, snooping through her jewelry box, I found this ring and snagged it, thinking it was the prettiest thing I’d ever seen. I kept it for years, through various moves, truly thinking it was my grandmother’s engagement ring, deeply ashamed of having swiped it. My old job was located next to a jeweler—they tested the ring to discover that the diamond was a fake but the gold was real (although low-quality and not worth much). I developed theories about the ring. Was she given a fake? Was it a replica of her ring from the sixties? How did this fake engagement ring find its way into the back of a tiny drawer in my grandmother’s jewelry box? When I finally got engaged for real, I went to tell the news to my grandmother. I decided it was a good time to come clean about my thievery at least a decade prior. Instead of being mad, she thought it was hilarious—apparently the ring had been my aunt’s…and no one had known that it wasn’t real! Drama! My aunt has been divorced for probably nearly 20 years, so it’s water under the bridge, but it’s still fascinating that this little bizarre artifact found its way into my hands. My grandmother laughed again and told my mother, “Imagine if she’d made off with a real diamond!” It was kind of a cute family moment. My actual engagement ring is my mother’s from the nineties. We’re having the diamond reset into the ring (it was removed to be weighed & graded), and having the ring dipped by some sort of magic/alchemy to be white gold instead of yellow. It’s a marquise cut with tiny chip diamonds along the sides—my totally unique dream ring. But for now, I’ve got my fakey to help everything feel real. In any case, thanks, Etsy, for making my engagement dreams come true, Mom, for saving her ring to pass down to me, and Grandma/Aunt Michelle for helping keep me sane while I wait for my ring for another week.